Thanks so much for stopping by for this weeks Play Date Cafe Challenge! Before I share details on this weeks colors, I have to tell you a bit about this weeks challenge, so you don't think the whole team has "gone to the birds". 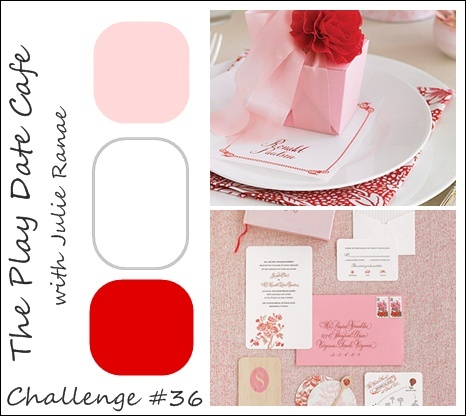 This past week the team was chatting about the Bird Cage Die, and Ruby issued the challenge to use it along with this weeks colors. Julie's wonderful colors for this week are Red, White and Pink (see inspiration photo below). 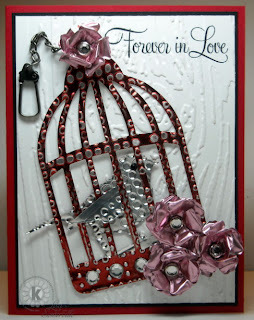 If you have the Bird Cage Die, or birds, why not incorporate them with this weeks colors! 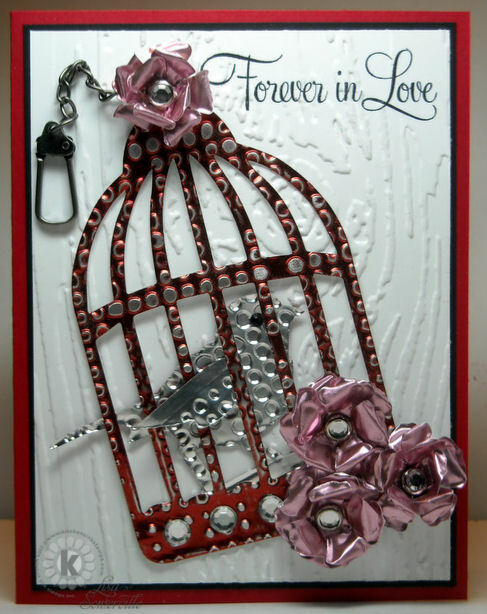 The bird cage is a piece of metal from Ten Second Studios that is embossed with a Texture Fades Folder, then cut with the Bird Cage Die, the Bird is cut from the same piece of metal, just flipped over. I created the flowers with the Tattered Floral Die, layering the flowers and curling the edges. The White panel is also embossed with a Texture Fades Folder. Here's this weeks Color Story Photo, we'd love for you to play along with this weeks challenge at The Play Date Cafe, you can find all the details here on how to enter. While you're visiting the Cafe, be sure to check out the wonderful new badges that Paul created for the Cafe players, be sure to grab an "I play at the Play Date Cafe Badge and add it to your blog (see directions at the bottom of this post). If you upload to any online gallery please use keyword PDCC#36 so we can find your creations! This weeks Sponsor is Lawn Fawn Stamps. Love the metal cage! The roses are gorgeous and the design beautiful. You know I love that birdcage! Very cool it is! Great flowers, which I even know how to make them, but always forget! Love it! Wow! this is amazing, Lisa! LOVE the metal cage.. great textures! And those flowers are fabulous!! And THANKS for all you did for our badges and websites:) Your talent and knowledge are appreciated!! I am so thankful for your help!! This is fabulous! What a neat way to incorporate such wonderful texture into your card. It's so elegant too! WOW! Wonderful card. Love the colors. You rocked that color challenge. Oh, Lisa! This is awesome! I just bought this die cut for a good friend and wouldn't you know...she shares my stamping room with me! Oh so pretty Lisa! Love the metal & jewels! This is absolutely GORGEOUS Lisa! I love the way you've done it in metal, it's so effective! FAB, I LOVE it!!! Hi Lisa...I love your metal Birdcage!!! wow...what a cool card...wonderful work!!! That is just so cool ... love what you do with that birdcage ... fabulous!